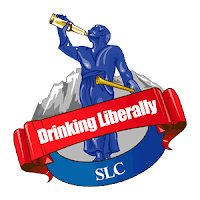 In Salt Lake City and Denver, over the next week, special events are going raise funds for the national programs of Drinking Liberally...while raising pints with local members. In Utah, this Friday's fete features Laughing Liberally comedian Lee Camp, a "Bush in 6 Words" competition, live music and Salt Lake celebs. In Denver, on June 11th, the "Save the Ales" celebration invites you to schmooze and booze, and save the planet, one keg at a time. 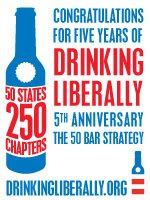 Other chapters have been collecting "tips" to support the national network: Kathy and Chris from Springfield, Illinois, have sent in their group's contributions several times; as have the Des Moines drinkers recently. In New York, we hosted our own fundraising party under a month ago -- and all of these funds help bring this organization to every corner around the country. We don't hit 50 states without a strong, sustainable organization -- and that support comes from all around the country. So thank you, Denver, for proving the Square State isn't too square...and SLC, for proving there are liberals (and drinkers) in Utah...and Springfield, Des Moines, and the many other chapters that chip in to the Liberally family.